ISLAMABAD -- Pakistanis are welcoming the government's move to ban cash donations to entities and individuals proscribed by the UN Security Council, which some say is directed at the Falaah-i-Insaniyat Foundation (FIF). The Securities and Exchange Commission of Pakistan issued the ban notification January 1. As part of the move, the State Bank of Pakistan was also expected to issue a notification ordering Pakistani banks to freeze the accounts of all entities and individuals named in the UNSC's list. The Ministry of Interior also released a list of 72 blacklisted outfits, which includes Hafiz Saeed's Jamaat-ud-Dawa (JuD) and its FIF charity, both allegedly linked to banned terrorist group Lashkar-e-Taiba (LeT). Aiding and abetting any of the banned organisations, financially or otherwise, will be considered a crime, according to the ministry. The government has also prohibited fundraising by the proscribed organisations and individuals, as well as any of their social, political, welfare and religious activities. A fine of up to Rs. 10 million ($90,300) has been set for any entities who do not comply with the ban on donations. The US State Department first designated FIF as an alias of LeT in November 2010, accusing it of being a different name for JuD, another alleged LeT front. A top-level meeting January 1 of Pakistani officials from various departments and chaired by Prime Minister Shahid Khaqan Abbasi led to a decision to implement FIF's terrorist designation across the country, Dawn reported. Nevertheless, the Interior Ministry issued a statement the same day saying the action was part of the implementation of the National Action Plan (NAP) against terrorism and that no single group or entity was being targeted. 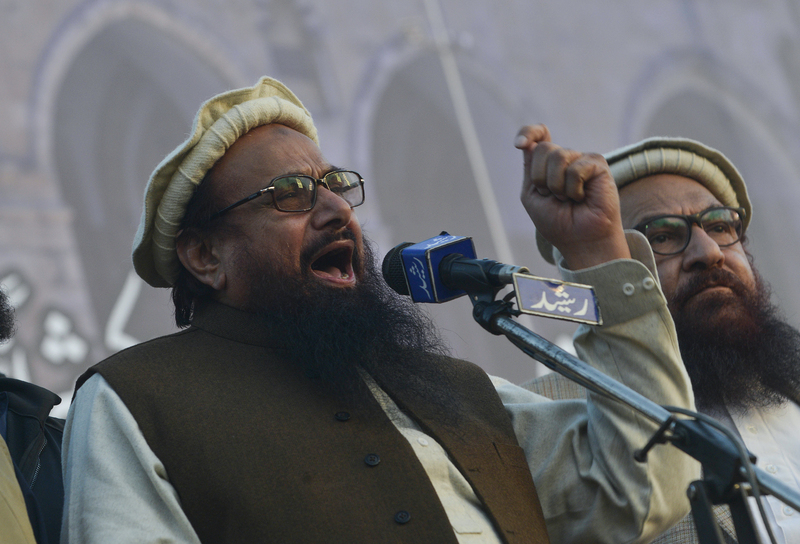 JuD chief Saeed told the BBC January 2 that the group had not received any directives from the government. "We have been cleared by courts and will again seek legal support when we get a notification. The government wants to placate the international powers," he said. Saeed said that there was no evidence that FIF was linked to terrorism, pointing out that it was registered with the government as a welfare organisation. The FIF operates 308 ambulances, 250 medical centres and 12 hospitals in 31 cities, he said. Authorities have already been taking action since the new ban. Police in Islamabad have removed FIF banners and registered three cases against the group. The government action specifically targeted FIF, confirmed Brig. (ret.) Mehmood Shah of Peshawar, former security secretary for the Federally Administered Tribal Areas (FATA). He called the move a "positive development". "Not only have the militant groups hampered the country's progress and killed innocent civilians, but they bring into notoriety the whole nation, [which leads to Pakistanis being viewed] with suspicion in other countries," he told Pakistan Forward. The Pakistani army has been fighting terrorism for nearly two decades, but it is up to the government to make policy decisions against militants, he said, adding that the government should immediately remove the banned groups' donation boxes and close their offices. "We welcome the move as the militant organisations have been instrumental in acts of terrorism in the country," Awami National Party General Secretary Mian Iftikhar Hussain told Pakistan Forward. "The decision to ban their source of funding will ultimately result in the ineffectiveness of such groups." There should be no distinction between "good" or "bad" militants, he said, urging action across the board to eliminate militancy from the country forever. Militant organisations collect donations, claiming that they will be used for relief activities, Hussain said. Instead, they use the funds to sponsor acts of terrorism. "The whole nation as well as political parties and civil society organisations have thrown their weight behind the government to do away with terrorism and establish peace," he said. Ubaidullah Khan, a political science lecturer at Abdul Wali Khan University Mardan, also welcomed the initiative. "It is the need of the hour to plug funding of all organisations accused of terrorism," he told Pakistan Forward. "Pakistan is facing isolation internationally, and the nation is paying the price for the follies of a few." "We have lost 70,000 people, including members of security forces, in the war against terrorism," Khan said. In addition to economic losses of Rs. 10 trillion ($90 billion), he said, "[We] cannot afford any further harm." this article is not representing the pakistanis. You have not represented what Pakistan's public vowed for. You should consider the fact that MML is the party that have taken 3rd rank in a position in NA 120 Election in lahore which defies the whole article. Not.... Because JUD are pro Pakistan organization.